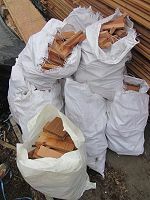 Wooden Briquettes and other products in Gloucestershire, High density sawdust and wood chip briquettes the best and economical alternative to fire wood logs or coal. Ideal for stoves and open fires. As well as our popular wooden briquettes we also offer for collection other fuel for your fire. 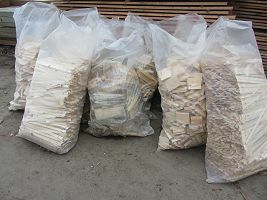 Large bags (approx 30kg) of cedarwood and redwood off cuts at just £5 per bag. 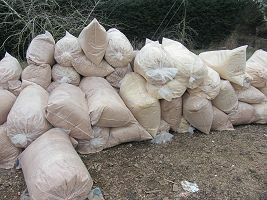 the cedar ones are £2 per bag. Economical fuel products from Beekind Briquettes of Gloucestershire, call in and collect some today. "I regularly use Beekind Briquettes. They are far superior to other briquettes I have used, they offer excellent value for money, the don't crumble apart in your hand and my wood burner is up to temperature in just a few minutes. I would recommend these wooden briquettes to anyone."